Adolfo Suárez Madrid-Barajas Airport is the largest airport in Spain and one of Europe’s busiest. It serves the Spanish capital, Madrid, which is southwest of the facility. Our guide to the airport includes information regarding terminal facilities, transportation options and nearby hotels. Madrid-Barajas Airport has more than 20 information counters, located throughout the terminals, and touchscreen kiosks in Terminal 4. More than 100 staff members are also on hand to assist passengers. From the M40 (ring road) encircling central Madrid, head onto the A2 eastbound (in the direction of Barcelona) and take the exit at junction 10 to the M14, which leads directly to the airport. The total drive time from central Madrid to the airport is approximately 20 minutes. Bus: EMT (Madrid Municipal Transport Company) (tel: +914 06 88 10; www.emtmadrid.es) runs regular services between Madrid-Barajas Airport (Terminals 1, 2 and 4) and central Madrid. Bus 200 connects to Avenida de América station (journey time: 30 minutes; fare: €1.50), while the Línea Exprés 23 operates to Atocha station (journey time: 40 minutes; fare: €5). Several intercity bus and coach services also serve the airport. Taxi: Taxis are available from outside all terminals (journey time to the city centre: 20-30 minutes; fixed fare: €30). Passengers should make sure the meter is turned on at the beginning of the journey and they are advised not to accept any offers of taxis inside the terminal building – official taxis are white in colour with a red stripe. AeroCity-Ares Mobile (tel: +34 902 15 16 54) provides chauffeur-driven cars. Rail: RENFE (tel: +34 90 232 0320; www.renfe.com) trains operate along the C1 route between Madrid Barajas Airport Terminal 4 and Prínicipe Pio station in the city centre (fare: €2.60; journey time: 40 minutes). The service also stops en route at Atocha (journey time: 25 minutes) and Chamartín (journey time: 11 minutes). There are RENFE offices in the arrivals area of Terminals 1 and 4, which provide information and ticketing services for the national rail network. Metro: Madrid Metro (tel: +917 796 399; www.metromadrid.es) line 8 connects Madrid Barajas Airport with Nuevos Ministerios in the heart of Madrid's financial district (journey time: 15 minutes; fare: from €4.50). Trains leave from the underground stations at Terminals 2 and 4. The metro also provides links to stations on the Spanish railway network. Madrid-Barajas Airport has two banks, one in Terminal 2 and another in Terminal 4. There are also currency exchange services and ATMs dotted throughout the airport. There are more than 30 cafés, bars and restaurants at Madrid-Barajas Airport distributed throughout the terminals. A selection of more than 100 shops can be found at the airport, including duty-free for passengers leaving the European Union. Items available will range from local produce and souvenirs to jewelry and electronics. Lost property offices are situated in terminals 1 (tel: +34 91 393 6119) and 4 (tel: +34 91 746 6439), while left-luggage facilities (tel: +34 917 466 065) can be found in terminals 1, 2 and 4. There are nurseries in terminals 2 and 4 and a children’s playground in Terminal 2. Pharmacies are located in terminals 1, 2 and 4, while first aid stations are in Terminals 2 and 4. Madrid-Barajas Airport also has chapels in terminals 1, 2 and 4 and travel agencies and tour operators in the arrivals areas of the terminals. Seven meeting rooms are available for hire (tel: +34 91 393 6519), and there are VIP lounges in all terminals. Madrid’s IFEMA Exhibition and Convention Centre (tel: +34 91 722 3000;www.ifema.es) is situated just a short drive away from the airport. Sercotel Madrid Aeropuerto (tel: +34 915 645 906;www.sercotelhoteles.com), one of the closer hotels to the airport, also houses a business centre and a number of meeting rooms. Free Wi-Fi access is available throughout the airport. Additionally, there are almost 100 Internet areas positioned within the terminals, along with several mobile phone charging points. A post office is located on the ground floor of Terminal 1. The airport is fully accessible to wheelchair users. Airlines can provide wheelchairs upon request, however, passengers should request this service prior to travel. There are reserved car parking spaces for disabled travellers in the airport car parks. Long and short-stay car parking is provided within six public parking areas. Short-term options include the outdoor P1 car park in front of the terminal building, the indoor P2 car park, which has direct access to terminals T2 and T3, and a ‘parking express' facility for stays of less than 30 minutes at Terminal 2. Long-term parking is available at a remote car park, and	a free shuttle bus operates between this area and the terminals. 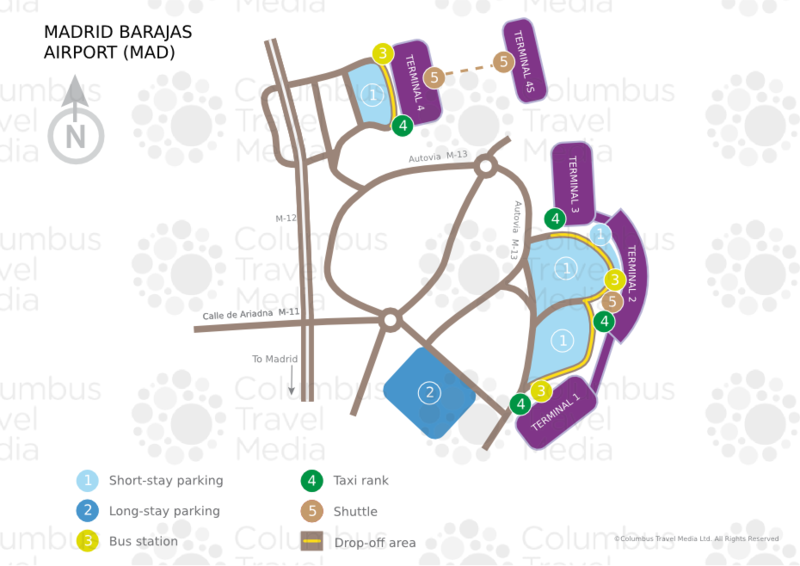 Additional services include VIP car parks near each terminal. Parking can be pre-booked via the airport's website. Car hire companies represented at Madrid-Barajas Airport include Avis, Enterprise, Europcar, Hertz and Sixt. Car hire desks are located in terminals 1, 2 and 4.